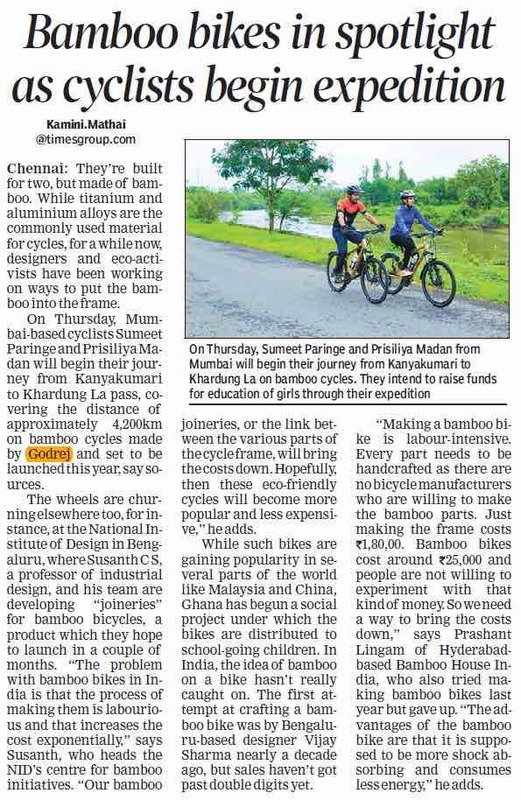 When cyclists Prisiliya Madan (22 years) and Sumeet Paringe (26 years) met the makers of Godrej’s sustainable bamboo-framed bikes, an idea was born- why not go on a journey on these very bikes across the length of the nation? And it would be no ordinary journey – during the ride, they would raise awareness and support for the girl child education in India. A cause close to their heart, their aim would be to raise INR 50 Lakh ( at the very minimum ) to support the education of 1500 girls for one year. 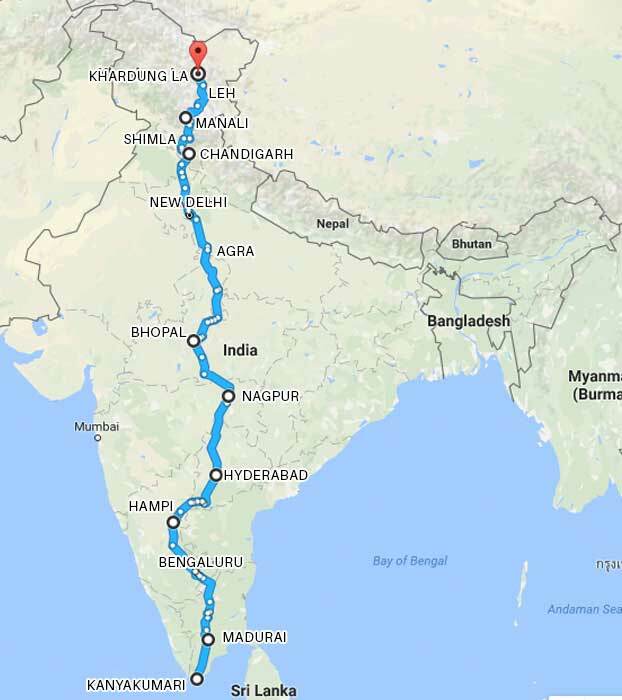 Today, they are on this very journey, bringing this idea to fruition – riding from Kanyakumari to Khardung La pass on a grueling 63 day, 4400 km long journey. Driven by passion and determination, the only thing they need now, is your support. HOW THIS IDEA WAS BORN! Vijay Crishna, Executive Director (Lawkim Motors Group Division of Godrej and Boyce Mfg Co Ltd) travelled to Antarctica and happened upon a bamboo framed bike. He was so inspired by the strength, agility and design of the bike that he invited the designer of the bike Craig Calfee to India to replicate and work on this sustainable product. Craig took Lawkim’s team through a special 14-day Workshop specially designed by him to make the initial Prototypes. He remains committed to the Project and has appreciated the excellent finishes of the bike frame made by Lawkim. WHO ARE THE BIKE RIDERS? Sumeet Paringe, age 26, a cycling enthusiast, hailing from Panvel, Navi Mumbai, travelled to India’s highest motor-able road (18,380 ft.), Khardung La from Panvel in September 2014. Which was in itself a great feat of endurance! In another fascinating cycling adventure, Prisiliya Madan, age 22, also from Panvel completed a journey from Panvel to Kanyakumari, i.e. 1800 km, in January 2016. A feat that requires a great amount of resolve and strength to undertake a journey of such a distance, and that too all alone! Now, together they are about to embark on Godrej’s bamboo-framed bicycles to traverse the entire length of the country in a truly natural and sustainable way - one can even call it a Green endeavor! 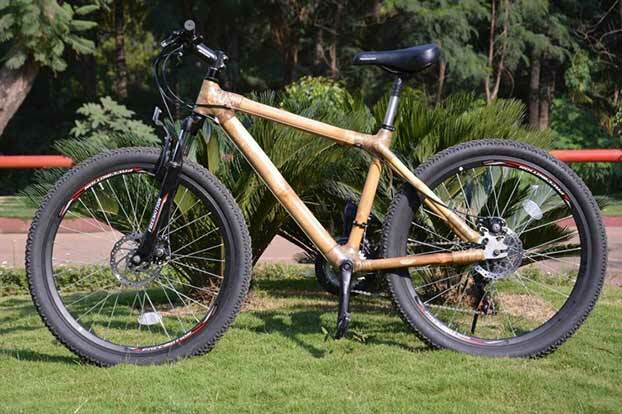 This is a journey that will test not only the resolve and strength of the riders, but it’s also going to serve as a litmus test for the hardiness, durability and sturdiness of the Bamboo bike. While education is available to everyone across the country, the stats below tell another story. 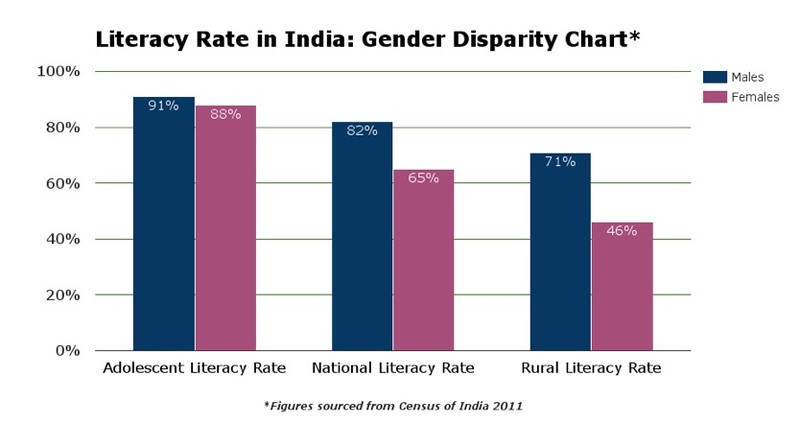 We realise that there is a growing need to promote girl child education. Something that has been neglected for generations. IIMPACT was started by alumni of the 1978 batch of IIM, Ahmedabad . Supporting the education of 1500 girl children at the minimum is the objective of this initiative . During the ride, starting from 10th July, 2016, Sumeet and Prisiliya will also look to spread awareness about girl child education and raise funds for this much needed cause. They are going against the odds – Can you do something to help in terms of support? 1. There are many reasons why bamboo is such a good medium for this product. Bamboo grows easily in dry climates and with little Irrigation. K2K CYCLISTS FOR CHANGE - CONGRATULATIONS!!! Prisilya and Sumeet have successfully completed the daunting journey - from Kanyakumari to Khardungl La Pass........It was a cold 5 degrees up there at the height of over 18,000 ft. The cyclists covered 4,000 kms in 63 days. This brave duo&apos; desire to galvanize Rs. 50 Lakhs (at a minimum) for IIMPACT’s girl child education program is going to be fulfilled - with your support. So far close to 34 lacs has been successfully raised - 16 lacs remain to be raised over the next 8 days. YOUR HELP IS REQUIRED TO HELP MAKE THIS HAPPEN - do support to help them make an even bigger difference. They have continuously highlighted the issue of girl child education that exists in our country through their amazing journey - please do spread the word and THANK YOU for your generous support. .Its cold up there - 5 degrees!!!! They interacted closely with the cyclists. The duo explained to them that one should never be scared of trying out new things, to dream big and to never fear failure. The importance of girls studying and making something out of their lives was talked about. Truly inspirational moments for both IIMPACT&apos;s girls and for the cyclists as well! Friday, August 26th, 2016 ! What a special day it was!!! Prisiliya Madan and Sumeet Paringe both arrived in New Delhi - having cycled all the way from Kanyakumari. The entire IIMPACT Gurgaon office team had been waiting for this day as they were eager to meet this dynamic duo face to face. They traveled to India Gate leaving their respective homes bright and early in the morning just to get a few precious moments with the cyclists. Here is a lovely shot of the team with the duo with Rashtrapati Bhavan in the background. More power to the Duo from the entire IIMPACT Team!!! We at our IIMPACT centres have some very talented girls, who if given adequate support and encouragement could do us all proud - at School level, at District level, at State level, National level and perhaps even on a Global Platform. Participating in sports can provide great confidence boosts and help in developing leadership skills and build a healthy team spirit. Three cheers for both of these amazing young ‪‎women‬ ‪‎achievers‬ - a BIG congratulations from 60000 ‪‎IIMPACT‬ girls and the rest of the IIMPACT Team!!! You have done us all proud. The Duo is moving ahead at a good pace. "When you educate a girl, you educate a family." 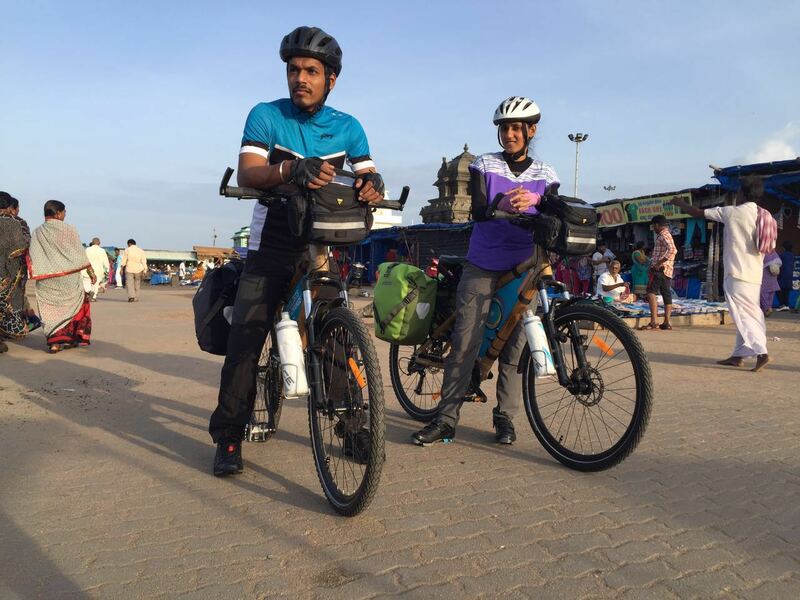 Two young cyclists, Sumeet Paringe and Prisiliya Madan, have embarked on a cycling tour across India to garner support for a cause that is close to their heart -- education for the girl child. Their love for cycling is the bond that has cemented the friendship between Sumeet Paringe, 26, and Prisiliya Madan, 22. 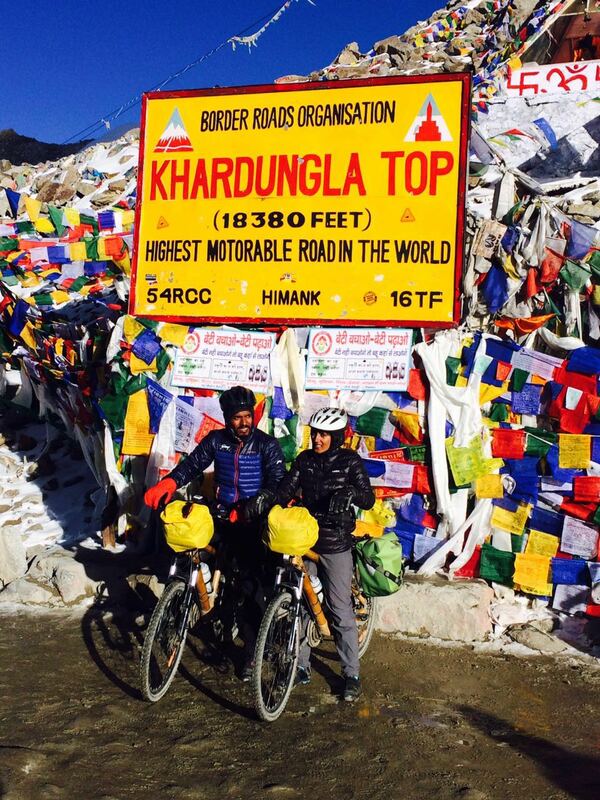 Fortunate enough to have supportive parents backing their dreams, these two youngsters have set out on a mission to cycle from Kanyakumari to Khardung La to raise funds for the girl child. They hope to raise Rs 50 lakhs in order to support the education of 1,500 girls for a year. Sumeet and Prisiliya’s friendship dates back to their childhood when they would go trekking and cycling together. Little did they realise then that, one day, they&apos;d set out on a cycle journey that would cover more than 4,400 km. 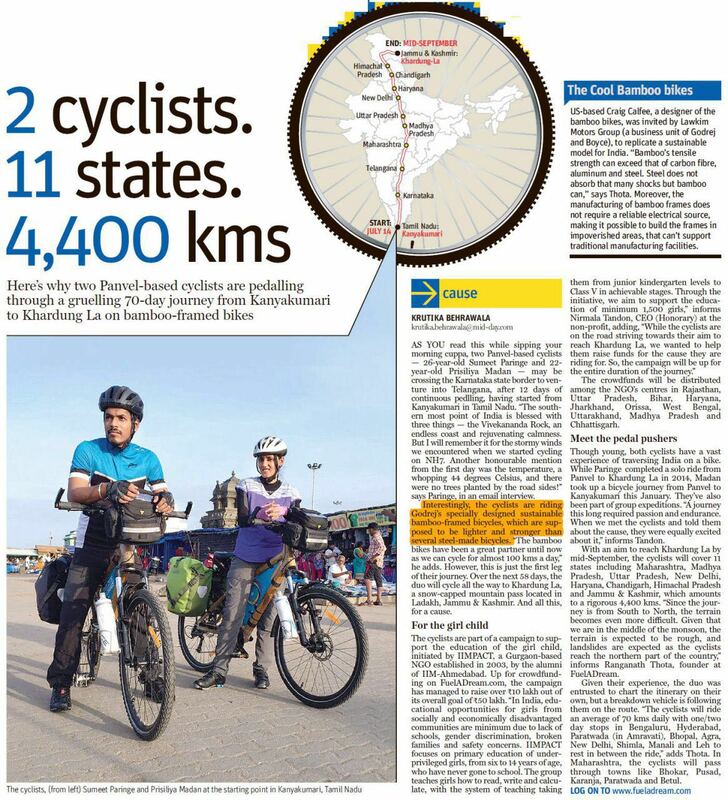 Their journey started on July 14 from Kanyakumari and they expect to cover 11 states in 70 days, riding their bicycles all the way through to the Khardung La Pass, one of the northern-most points of the country. They plan to cover the states of Maharashtra, Madhya Pradesh, Uttar Pradesh, Delhi, Haryana, Chandigarh, Himachal Pradesh and Jammu and Kashmir. Sumeet Paringe is a cycling enthusiast and he has cycled to India’s highest motorable road (18,380 ft) at Khardung La, Ladakh, from Panvel near Mumbai in September 2014. Prisiliya has cycled from Panvel to Kanyakumari, the southern most tip of India, covering a distance of 1,800 km in January 2016, on a solo trip. To Sumeet and Prisiliya, their latest adventure is much more than realising their lifelong dream to cycle across India -- this time, it is the cause that matters more. "When you educate a girl, you educate a family", says Sumeet, an engineer by profession. Prisiliya, who has completed her masters in computer science, feels she is fortunate to have been able to complete her studies. Her parents have always encouraged her to live her dreams. But not every girl child in the county is as lucky. They were shocked when they saw the statistics about girl child education in the country. That&apos;s when they decided to do something about it. "My father is a cyclist and a trekker. He has been very supportive and encouraging," says Prisiliya. "The statistics on girl child education is scary," she adds. "We had the freedom to live our lives and study, but what about other girls in the country? I want every girl child in India to go to school and I hope that our cycling expedition creates a buzz in society." Helping them with their cause are the Godrej Group (the people behind the bamboo-framed bicycles that they are using on this trip) and IIMPACT, a non-government organisation that helps educate girls in rural India. The duo have set out on an epic journey and their mode of transport is something out of the ordinary. They have chosen to cover the distance on bamboo bicycles. "These bikes are really smooth and the vibration is lesser than the regular ones," say Sumeet and Prisiliya, who have already covered over 500 km of their journey. "We ride on a daily basis. Our day starts early and we ride from 7 am to 9 am. We halt for breakfast and ride till noon before breaking for lunch. We are currently in south India. We were expecting to ride in cool weather as it rains here during this time of the year. But we&apos;re riding in almost 35 to 40 degree heat, so we avoid riding in the afternoon. Also, it can get extremely tiring riding in the heat, so we need to take breaks,” says Sumeet. Safety is a primary concerns and one, says Prisiliya, they are not taking lightly. The duo make sure they ride on the passage (this is a lane on side of the road earmarked for cyclists). They also use safety jackets and helmets. "When driving on highways, we need to be careful as vehicles zoom past us," adds Prisiliya. "We stop cycling at 6 pm in the evening as it gets dark." IMAGE: The cycling enthusiasts at Kanyakumari. Photograph: Kind courtesy Sumeet Paringe and Prisiliya Madan. The duo has packed light for the journey. "We&apos;re just carrying 17 kg on our backs, which is easy to manage. In the past, I have carried 25 kg on a bicycle journey." But they are still getting used to the food served at the roadside food joints in south India. "Almost every place serves sambhar and rice," laughs Sumeet. "So that&apos;s what we are having for most of our meals. But we are looking forward to varied food options in the north and north-east." Sumeet and Prisiliya enjoy watching young children going to school as they ride past them on their cycles. It brings a smile on their faces as it reminds them of their cause. "We get off our bikes and shake hands with these kids. We take photos with them," says Sumeet. "If anyone is interested, we tell them about our mission too." Given the language barriers, communicating with the locals in the interiors has proved to be a challenge, but they hope to reach out to more people on their journey. "People are curious about our mission but all we can give them is basic information. People at the grassroots don&apos;t actually understand the severity of the issue," he mourns. Cycling together has often got them curious stares. After all, it is not every day that villagers bump into a boy and a girl riding on bamboo bikes. Sumeet says the children are the most curious. "They are fascinated by our cycles," he grins. "They always have plenty of questions about them." The journey has also introduced them to helpful strangers. "There was a time in Madurai when we were riding in the scorching heat at 2 pm. We stopped at a roadside stall to quench our thirst. We had a glass of buttermilk each but when we offered to pay, the vendor refused to take money. I think he saw that we were tired and was only too happy to help," says Prisiliya. Sharing a wonderful article that appeared in Mid Day - Mumbai. The Dynamic Duo are well on their way on this 70 day journey. 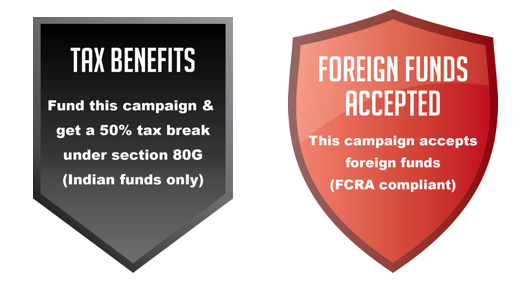 They have managed to raise over INR 10 lakhs since the start of this campaign! It is with great excitement and pleasure that we would like to inform you all that Summet and Priciliya have started their cycling journey from Kanyakumari on the 14th of July, 2016. We would like to wish them a safe, happy and a memorable journey across India. You will receive a personalized shoutout on the IIMPACT FB page. You will receive a thank you poster made by the kids at IIMPACT. Thank you song will be sung by the kids at IIMPACT .This will be sent to you by email. As a token of appreciation, the IIMPACT learning center will be named after you. We cannot thank you enough for this gesture.